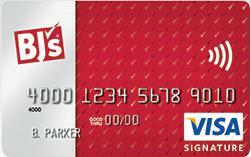 Receive advance notice of special offers and deals before everyone else when you have a BJ’s Visa Signature card. Use your BJ’s Visa Signature card at BJ’s stores and gas station and receive $2 back for $100 you spend on their already low priced merchandise. You pay no annual fee and no interest at all on your purchases when you pay the balance off in full every billing cycle. Meanwhile BJ’s gives $2 for every $100 you spend at BJ’s and even $1 for purchases anywhere the Visa card is accepted. If you qualify for a BJ’s Business card, you may not even have to pay sales tax on certain purchases. BJ’s offers it’s members in-club coupons, instant online coupons, special email offers and everyday low prices. In addition the BJ’s Visa Signature card gives you peace of mind should your purchase be defective or don’t satisfy your needs with generous return or exchange policy. Apply here for the BJ’s Visa Signature card and find out about the benefits of a BJ’s membership here.